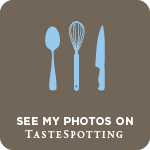 Are you still on the look out for something delicious to serve with that glass of chilled white wine or sherry ? 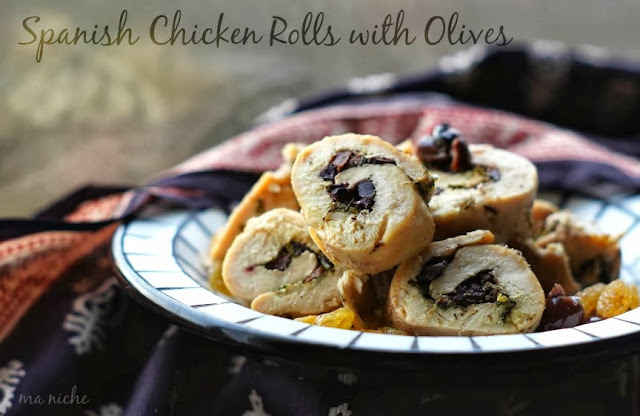 Something to nibble between the sips and the conversations... then try these Spanish Chicken Rolls with Olives. They are pretty awesome ! It is a recipe inspired from the book Tapas. While I had heard the word Tapas before, till sometime back I did not know where it came from... Here is what I learnt from the book. The word Tapas comes from tapa, a Spanish word for lid - specifically the "lid" created by the slice of bread that an innkeeper would thoughtfully place on top of a customer's wine glass to keep out the flies and dust between sips. The Andalucians then came up with the idea of balancing a morsel of something tasty on top of the bread to nibble on..... and a new Spanish institution was born. Combine all the ingredients of the marinade in a big flattish bowl and keep aside. Place the chicken breasts between 2 sheets of plastic wrap or parchment paper and beat gently with a meat mallet or the side of the rolling pin till they are about 1/8 inch in thickness. Place the flattened chicken breasts in the bowl containing the marinade, coat them well with it. Cover the container and refrigerator for at least 1 hour or up to overnight. When ready to cook, preheat oven to 350 degrees F.
Mix 3 tbsps of the olives, the butter and the cilantro in a bowl. Spread the olive and herbed butter over one side of each flattened chicken breast and roll up. Secure with a wooden toothpick or tie with a clean string. Place the chicken roll ups in a oven proof dish. Mix the olive oil and the sherry in a cup and season it with salt and pepper. Drizzle the oil-sherry mixture over the chicken roll ups, add the remaining marinade and olives to the baking dish, cover it loosely with an aluminium oil and bake in preheated oven for 45 minutes. Remove the foil, add the raisins in the baking dish and bake for another 5-10 minutes, until the chicken pieces are tender and the juices run clear when the chicken is pierced with a sharp knife. Transfer the chicken rolls to a cutting board. Discard the toothpicks or strings. Then using a sharp knife, cut them into slices and serve on warmed serving dishes along with the remaining chopped olives and raisins. It is easier to cut the chicken rolls from logs prepared from half of the chicken breast rather than a whole chicken breast. In case you prepare these in advance, cut the chicken rolls and put it back in the dish it was baked, and just before serving cover the dish with aluminium foil and reheat in the oven for 5 minutes at 350 degrees F.
In case a few pieces from the rolled log fall while you are slicing it, don't panic... Simply put the chicken rolls, olives and raisins in a serving dish and serve as a side.... they taste just as good ! 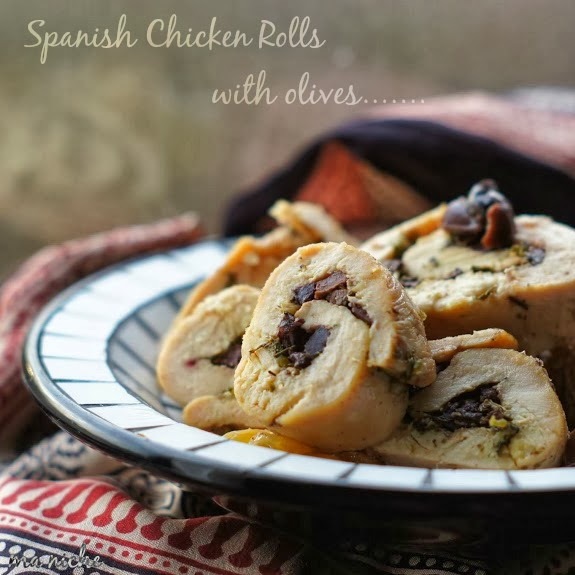 Your Spanish Chicken Rolls with Olives look amazing and I can't wait to try them. Thanks so much for sharing your great recipe with Full Plate Thursday and enjoy your Thanksgiving week! We love chicken and olives in my family. 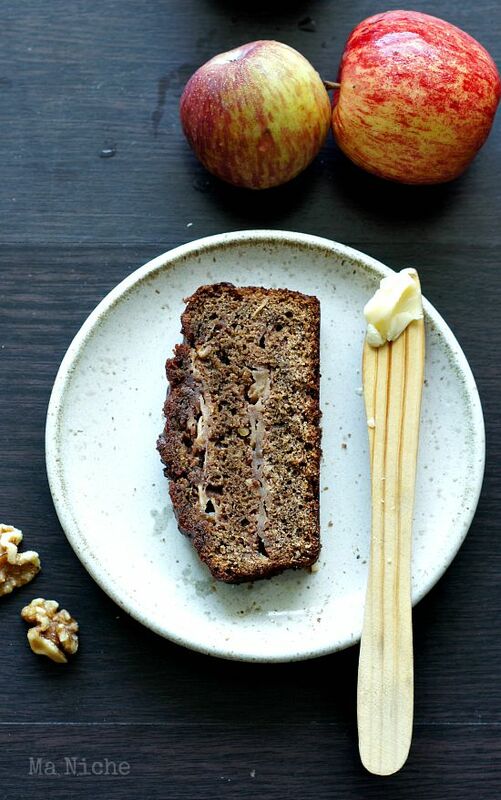 Thanks for this good looking dish with us on foodie friday. You're singing my song Tanusree. Spanish, chicken and olives are 3 of my favourite things. This looks absolutely beautiful. I'm featuring this at tomorrow's party. Thanks so much for linking up to Thriving on Thursdays.